This video still shows a fireball 20 times brighter than the moon light up the night sky over Chickamauga, Georgia on Aug. 28, 2013. A dazzlingly bright fireball lit up the skies over the American South last week, and NASA caught the dramatic action on video. The meteor blazed up in the predawn hours of Aug. 28, putting on a brief but spectacular show for night owls in several southeastern states. The asteroid that sparked the sky show was probably about 2 feet wide and weighed more than 100 pounds, Cooke added. The space rock hit Earth's atmosphere above the Georgia/Tennessee border at 3:27 a.m. EDT (0727 GMT) on Aug. 28, moving northeast at 56,000 mph. The meteor began to break apart in the skies northeast of Ocoee, Tenn., at an altitude of 33 miles, Cooke wrote. "NASA cameras lost track of the fireball pieces at an altitude of 21 miles, by which time they had slowed to a speed of 19,400 mph," Cooke wrote. "Sensors on the ground recorded sound waves ('sonic booms') from this event, and there are indications on Doppler weather radar of a rain of small meteoritic particles falling to the ground east of Cleveland, Tennessee." Every day, more than 100 tons of material — most of it grains of dust and other tiny pieces of asteroids and comets — bombards Earth from outer space. Virtually all of this stuff burns up harmlessly in the atmosphere, sometimes generating the bright streaks in the sky that we call meteors, or shooting stars, in the process. If a meteor blazes more brightly than Venus in the sky, it's classified as a fireball. 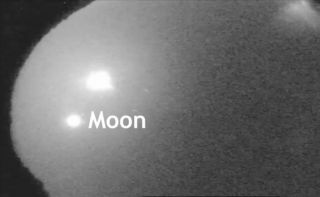 NASA's Meteoroid Environment Office has set up a network of cameras to track and study fireballs, with the aim of gaining a better understanding of where their parent space rocks are coming from. Such information should be helpful to spacecraft designers, NASA officials say. The space agency's All-sky Fireball Network currently consists of 12 cameras. Six of them are in the Southeast (spread across Alabama, Georgia, North Carolina and Tennessee), while two apiece are in Ohio, Pennsylvania and New Mexico. Editor's note: If you snapped an amazing photo of last week's fireball or any other night sky view that you'd like to share for a possible story or image gallery, please send images and comments, including equipment used, to managing editor Tariq Malik at spacephotos@space.com.